Odd seminar on “Discursive sensegiving in organizational change” » Triple E.D. Today we had our third Odd seminar for the semester. This time it was Robert´s turn to arrange it. 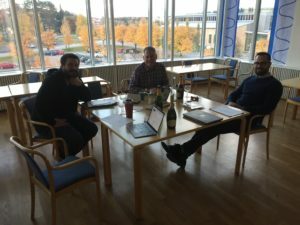 We had the opportunity to read and comment on the paper “Discursive sensegiving in organizational change” that Robert, Oscar, Ola and Markus has written. This also prompted a discussion on data analysis. Of course we had some wine and cheese too, and some bubbles to celebrate the group´s latest publication “A MATTER OF LIFE OR DEATH: HOW EXTREME CONTEXT RESEARCH MATTERS FOR MANAGEMENT AND ORGANIZATION STUDIES” written by Markus Hällgren, Linda Rouleau and Mark de Rond to be published in the Academy of Management Annals. This entry was posted in Seminar, Sensemaking. Bookmark the permalink.